Uncanny valley? I don’t think so. So Henri Bergius discussed John Gruber‘s claim that the free desktops are in an uncanny valley. Let’s leave aside the obvious bits that 1) desktops are absolutely nothing like robots trying to be people, and 2) clearly the fundamental basis of the uncanny valley is the “Pathogen avoidance/mate selection”, since in the tenth of a second it takes for your reaction to form, you obviously don’t have any time to ponder “Western constructions of human identity”. Given that people don’t get pathogens from their computer (unless you’re using a public internet terminal) nor attempt to mate with them (no comment), the uncanny valley isn’t very useful as an analogy. Now, don’t get me wrong. There’s a lot of details about desktop operating systems that are important; more on this in a minute. Obviously, a web browser is essential, but that’s a commodity. Now, I don’t want to get into a debate about exactly what percentage of people can be fully served by solely a web browser, but let me just note that for a lot of people, especially ones with overseas families, Skype is still a killer app. And you can’t write Skype in the default web security model (which is the relevant bit here, not a missing-the-point debate about AJAX versus platform widgets). Continuing on the subject of the uncanny valley, clarkbw told me a while ago there’s been HCI research to the effect that people are not generally too troubled by visual differences. Consider for example the evolution of the Start menu; it looks really different between each of Windows 2000, XP, and Vista, but generally people don’t have a problem with that. However what they do have trouble with is something that looks similar, but does something completely different. A good example here is how in the default GNOME panel configuration, we ship the “make all your windows go away” button in the bottom left. Kind of a bad idea, one that will go away with the shell design. But in general, I don’t think the problem has anything to do with an “uncanny valley”. If we’re talking about the consumer space, basically people just use the operating system that came with their computer, until it’s time to replace the computer. Overcoming this is I think largely a business problem, not a desktop interface problem. Given that data, considering that our target market is, like Windows, general purpose computing, it makes a significant amount of sense to consider issues that occur during transition and what the expected target audience needs. What did I mean by “general purpose computing”? Well, it’s a big world. Think of scientists and engineers using Scilab, or all of those fixed-function registers that currently run Windows. OLPC-type projects. Content creators who need to edit video. System administrators and developers (count me as a skeptic of editor as a service). 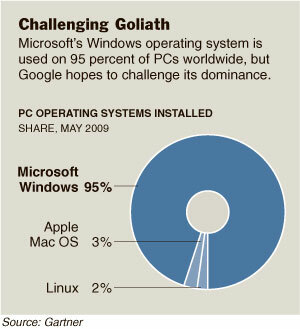 What about targeted “netbook” operating systems? There is definitely a large number of people who only need a lightweight computer. I think the core desktop should adapt automatically to those kinds of conditions; for example, you should be able to drop bits of GNOME you’re not using (say Evolution), and the panel should adjust Ubuntu Netbook Remix style. There’s definitely a place for Moblin type specialized interfaces, and as long as they’re generally compatible with the general purpose OS. Concretely, if say Skype has to rewrite or do significant work to adapt their app, there’s a problem. But regardless, if Moblin achieves its goal of being shipped by hardware vendors on netbook hardware regardless, it’ll be a huge step forward. Now, different people have different visions of where the GNOME Shell should go, and that’s healthy and fine. To an extent these different visions can be accomodated by different means. Ideally of course, we fix the problem in the default design. But failing that, it might work as a Firefox-style extension mechanism that we want to add, a separate project that builds upon shared infrastructure, or automatic interface adjustments like the netbook screen size one I mentioned above. But you can count me as believing that it makes sense to be sure that the apps you use today continue to work, while achieving the goals of making GNOME look nicer and more interactive than two grey bars, and fixing the obvious problems like poor access to your recent files, no application search, etc. Some of this we’ve done already, but there’s a lot more to do. If you’re interested and able, it’s pretty easy to dive in to the project!